Life just got even better in the beautiful Blue Ridge Mountains. The Lutgert Companies recently broke ground for the Cottages at Cranberry Cove, a new neighborhood of 20 single-family homes to be developed in the idyllic community of Linville Ridge Country Club. The neighborhood offers three- and four-bedroom floor plans from 2,400 to 2,800 square feet. 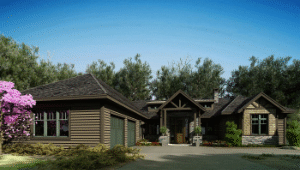 Each home will be built at an average elevation of 4,000 feet and situated on a minimum of one acre. Residents of the community are eligible for a variety of memberships in Linville Ridge Country Club. The exclusive club offers Har-Tru tennis courts, a heated mountainside swimming pool, a youth center, day camp, playground, full-service salon and spa, croquet courts, bocce ball, and five exceptional dining venues with formal and casual settings.